The chemical and accessory items in the Presta Ultra 2 Step Shop Pak take you through complete paint refinishing - from compounding to polishing to waxing. Ultra 2 Step Cutting Compound, 32 oz. : Fast cutting compound optimized to remove medium to heavy sand scratches. 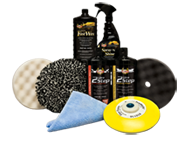 Works easily over a wide range of buffing speeds and finishes clean. Water-based formula contains no waxes, fillers or silicones. Ultra 2 Step Finishing Polish, 32 oz. : Advanced all-in-one polish and swirl remover. Designed for use on both new and ages clear coat painte surfaces. Creates a rich, deep gloss and a swirl-free finish in a single step. Fast Wax, 32 oz. : Liquefied paste wax with premium, natural and synthetic ingredients. Breathable, easy on, easy off formula goes on quick – wax an average size car in about 45 minutes. Provides a high-gloss shine and approximately 30-days protection. Spray 'N Shine, 22 oz. : Removes fingerprints and dirt and leaves an attractive shine on any non-porous, painted surface with this easy-to-use appearance enhancer. 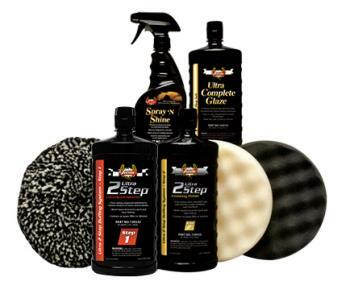 Also works great as a lubricant with overspray clay or during buffing when the compound, polish or pad gets too dry. I have a BLACK car. I have been trying to achieve that beauty in the paint that will take your breath away. I've tried a number of things but found myself unsatisfied. Using a wheel was scary because I'm not real experienced. I tried the 2-Step Ultra Buffing System with a little reluctance. The gut at the paint shop gave me some tips on using the wheel. I found your product very easy to use. I also bought a good buffing wheel and ran it at the slowest speed the whole time. Absolutely no burn marks! HooRah! And the finished product!! WOW!!! Could not be happier. If I could send a pic I would. Thank You Presta Products. I will recommend this to EVERYONE who is looking for the best finish possible. My car is a 1999 Mustang Convertible Cobra SVT. It was always garage kept, never seen salt. It came out absolutely fantastic.